I’ve loaded numerous images from the GH5 to my website for viewing. A miscellaneous gallery and images of the film crew I shot while being filmed for the Panasonic project back in Sept 2017. Both galleries have multiple pages. The film crew images let you see what I was looking at while being filmed. Just the opposite of what I usually see when out by myself. Also loaded are surfing galleries. All images in those were shot with the Lumix 100 – 400mm which is the equivalent of 200 – 800mm. Super fast and sharp lens even at 800mm. Excellent silky smooth 4k video too. That will be in a future blog post. To view the Surfing galleries, look to the far right on the header of my website. Some images will be added to my Fine Art galleries in the near future. All images on my website are available for licensing or as prints even if not marked. Once again, a big thank you to Transition Productions, Pyramid Film Inc., and Panasonic. Back in September, I was the photographer in a promotional film project for the Panasonic Lumix GH5 camera system. Of course, we ventured out to the lava flows. It was three days of filming along with one night. This was a large group and all did well on the long night hike to the lava flow. For most, it was their first experience at lava flows. The flow rewarded us all with two streams of lava at the base of the pali. They would spread out onto the flats near the base. The weather was also great until we started our trek back. Heavy cold rain moved in. That is perfect and much better than hiking back in the brutal Hawaii sun. The GH5 is an incredible camera. The options for video are endless. Stunning 4K at 60 fps. Met several great people who were involved in the project. My lava flow videos can be seen below or on my Youtube channel. The Youtube channel will have the description. Part 1 and Part 2. Read the description and be sure to watch all at high res, full screen. More video coming from the GH5 of surfing here on the Big Island of Hawaii. Also, news about the new gallery I’ll be in here in Kailua Kona after Thanksgiving. Feel free to leave comments if you have anything to say. Keep it family friendly, please. A big thank you to Transition Productions, Pyramid Film Inc., and Panasonic. A short article about me was recently published on Lonely Planets website. The one image that states its me against the backdrop of lava is actually a friend of mine. If you who know me, notice he has too many fingers and I’m better looking too. 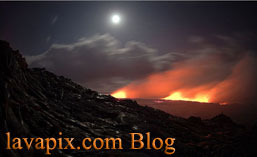 Activity at the current lava flow has been slow. I do have a new video on my Youtube channel that’s posted below. Just a series of relaxing surface flows. The subtle sounds are peaceful too. Be sure to share the article from Lonely Planets page. The links are at the end of the article. Prints from my adventures can be purchased on my website lavapix.com. Or locally at Krazy About Kona in the Kona Inn Shopping Village, Kailua Kona, HI.